Thursday started with rain to everyone’s disappointment. It was thought that it might be a good idea to rather give them the 2nd Nationals of the year as that may be more out of the rainy season at the coastal areas. After the rain subsided and the track had dried, we were able to start testing our settings and tyres after 1pm. The track is in a good condition in general with a few bumps here and there, but that made no difference to the good traction on the track. Friday morning we awoke early to the heavens opening up with rain. We were able to start at plus minus 11am with re-sugaring as the rain had washed it off. Around 1.30pm the times were starting to go on the board. Some good starting times were set by Wayne Joelson (he was in a league of his own). Wayne Sayers was clocking in fast laps with a mistake here and there, but showing the drivers what he can push his car too. Arnold Vermaak was also clocking in some good lap times with a mix of a few sub 11’s and 12’s. Andrew Plint was looking fast at times, but his motor seemed to be giving him some troubles. James had a few problems and his motor didn’t want to play the game. Luckily the guys were given time to try and sort out some of the gremlins they were experiencing. Rowan Bower started a little slow, but after a short while he was getting his rhythm. The 200mm lap times were very consistent between all the drivers. Matthew was also fast and seemed to know the track well and was doing some smooth laps. They were in the sub 14’s at this stage. James was on the hunt for the faster lap times, also placing on the board some sub 14’s. Rowan Bower start well and was in the league of his own, placing faster times than Friday. Matthew was also driving very well and closing the gap between himself and Rowan. Matthew was showing how good he has become with the racing and the help of his dad. James was also running on the same pace and was getting some good laps on the board. It was much the same until Rowan started having some problems with his motor in the race. With Matthew taking advantage of the situation. Rowan managed to hold on to first place with Matthew in second and James in Third. After Rowan replaced his motor, he was clocking even faster lap times than before. Taking another win from Matthew in 2nd place and James in 3rd place. What a good group to watch with enjoyable laughs in the midst of the racing on the drivers stand. A really nice vibe for the weekend! The start time was around 10am Saturday morning. 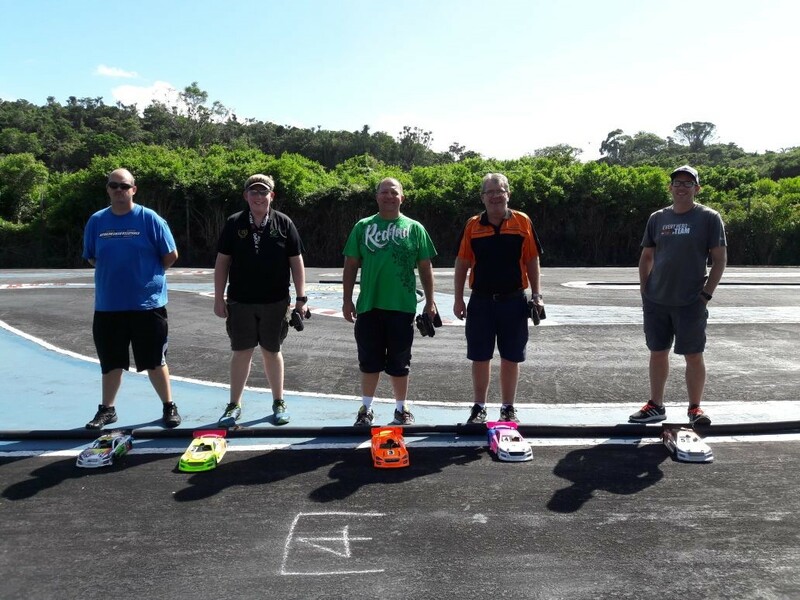 Weather had cleared up nicely and all the drivers were ready to show who can make their mark with the fastest lap times. Wayne Joelson went into the lead from the start with Wayne Sayers close behind in second. Arnold Vermaak close on their heels in third position and Andrew Plint in Fourth. Arnold was unable to finish as he broke his front and rear belt taking him out of the first qualifier. Wayne Joelson in the lead again and really showing the pace he had, and it was for the other drivers to follow, when he posted a 26 lapper. Arnold Vermaak put in his best round for the day after he had replaced the belts. Unfortunately Wayne Sayers was unable to finish due to car problems. Andrew Plint was also setting down some good laps for this 2nd qualifier round. Wayne Joelson went out into the lead from the start and couldn’t be caught by the other drivers. 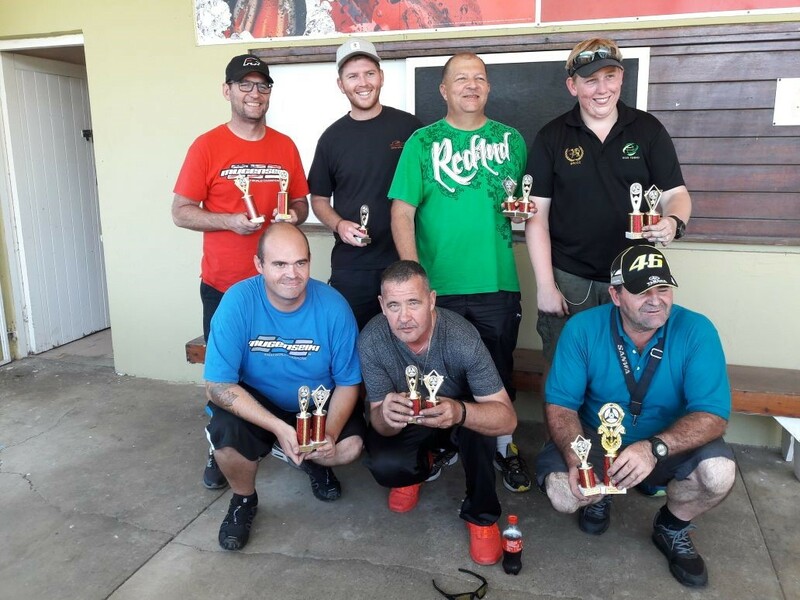 But there was a scuffle between the rest with Andrew Plint moving up into 2nd place, Arnold Vermaak into 3rd and Wayne Sayers into 4th position. Wayne Sayers was still having some issues with his car, which we only found the problem after the qualifying was completed. At long last the Sprint Championship has returned with a new 10minute system. Dave Wiseman would like this format. Just like the old days. It was a tussle between Rowan Bower and Matthew with only a lap between them. Matthew Attree and James Bruans were both pushing for second place, which made for some interesting watching for the spectators, but finally Matthew Attree took the 2nd place with James Bruans finshing in third. Peter Plint finished in 4th place with Michael Rabe in 5th. Rowan Bower was in the lead from the start. Rowan threw his car over once or twice during the final and ran out of fuel. Warrick Attree worked out the tyre wear, but despite that Matthew had to come in for an extra tyre change. Even with the extra pit stop for new tyres, Matthew held on to second place with a 3 lap difference between himself and Rowen. James had a few car issues of his own and finished the endurance in 3rd place. Peter Plint’s car’s belt kept coming loose and a sporting gesture before the race to get a new belt from one of the locals home, allowed Peter to sort out his issues. Michael Rabe finished in front of Peter Plint in 4th position. Some good racing between all the drivers doing the 200mm endurance. The racing started with Wayne Joelson in the lead, again clocking some of the fastest laps. Arnold Vermaak was holding onto 2nd place for a few laps until the belts, he replaced earlier stripped once more and he called it a day. Wayne Sayers was close behind and finally took 2nd place with some very fancy classy driving on his part. Andrew Plint finished in 3rd place with a fair drive and some engine cuts seen during the race. As usual Wayne Joelson went into the lead with some very smooth driving and being a class act of his own. Arnold Vermaak was on the pace for the first 17minutes then went off the track after breaking his car. After walking off the drivers stand he saw that the front tyre was broken and had to do a tyre change. Wayne Sayers was very fast and 15 minutes into the mains he made a mistake and his pit crew ran him out of fuel to the benefit of Arnold. Andrew Plint had reasonable pace with his car, but had issues with his engine “flaming out”. Andrew will need a good motor and will definitely be up there giving the big boys a run for their money. The tyre wear was high, but the track had good traction for the whole nationals. Thank you to Warwick Attree and his team for preparing the track for the BRCCC Nationals. A job well done and a friendly and enjoyable first National was enjoyed by all.